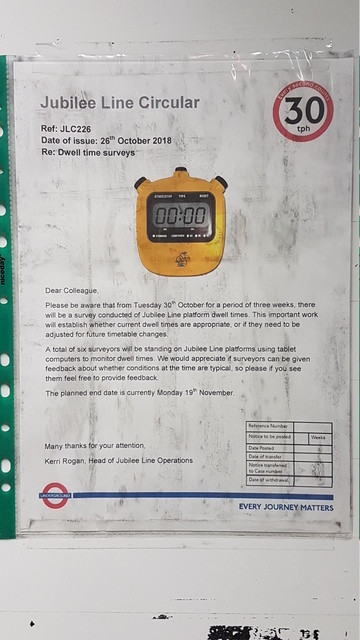 I saw a notice at Canary Wharf Jubilee line station today noting that over the next few weeks a survey of platform dwell times will be undertaken to establish whether the timings in the current timings are correct or whether they need to be adjusted in the next timetable. It mentioned that if the reader of the notice were to encounter the surveyors it would be appreciated if the latter could be advised whether the loadings at that time were typical for the time of day or not. I'm not sure who the notice was aimed at though as it was placed on the rear of the board providing notices to eastbound train operators. This is in a public area but a very lightly trafficked one - the only time passengers would see it is (as I was doing) walking from the lift to the eastbound platform behind rather than in front of the escalators, and only because I purposefully go out of my way to read notices did I take note of it. My partner's first question was "what is dwell time? ", which indeed the notice presumed the reader would understand, so I conclude the public aren't the intended audience. Only train operators with x-ray vision would be able to read the notice where it was positioned, and even if it had been placed on the side facing them the text was probably too small for them to read and would be too detailed to take in during the dwell time in addition to their safety critical duties. Station staff are a possibility but there would seem to be far more prominent locations for notices intended for them in non-public areas, and it isn't a place I can recall any staff member spending any significant amount of time - when they need to speak to the train operator they stand in front of the board rather than hide behind it. It's not inconceivable that beside the board would be a good place to do the surveying from - but I would hope that the surveyors would know the purpose of their exercise before being in a position to read this notice. Very interesting........given that the TBTC system records dwell time for every station and has done so for every train on theJubilee line since TBTC was commissioned. I wonder why they need humans to do it? TBTC does record the dwell and this is very helpful for timetabling, as where scheduled dwells are too short, trains will tend to stop for longer than planned and gain lateness and this will be apparent in the data. However, TBTC holds all trains to time. This means that the dwell time data will not show where the dwell is longer than required for alighting and boarding to be completed. Outside of disruption, the dwells will not go below the scheduled value. Very odd - seems the sort of thing timetabling would measure, but as far as I know, we aren't! Very definitely an internal thing, not intended for the travelling public. Perhaps the survey is monitoring if the dwell time is appropriate for the passenger loads or can be trimmed. The 30tph circle seems to indicate an attempt to figure out how many trains could be absorbed at a maximum? Having used Canary Wharf jubilee station since the day it opened (with a limited service to Waterloo I think as the two sections were not joined), it really is an interesting station for somebody to study dwell times and passenger flow in. In the evening peak, 515pm to 615pm at Canary Wharf, I feel dwell times are increasing due to a change in passenger behaviour. Since about 2006 in the above window, the limiting factor as to when a westbound train leaves is that the train is absolutely full and no one else can board. While the number able to fit on a train hasn't changed (I've put on ten kilos, but that's just me), mobile phones have made a change in my view. People walk onto trains more slowly than they did 15 years ago. I am now over 50 with bad knees caused by lifting heavy weights and early osteoarthritis. Yet, I see people half my age dawdle into trains slower than me at Canary Wharf. Some are easy to see why: they are looking at their phones while boarding (I notice this more at PED stations) while others stop as soon as they take two steps into the train to check their phone. This effect closes up the gap between trains. I can see that by checking the train indicator board when alighting at Westminster or Green Park to change: the gap between trains shows as smaller than it showed while waiting at Canary Wharf. In the evening peak, whatever gap/frequency line controllers are releasing trains from Stratford and North Greenwich, Canary Wharf dwell times normalise and evenly space out the service. October this year has seen a few occasions where very aggressive crowd control outside the station has meant trains between 530 and 6pm have left the station with spare capacity, but that is a recent and rare phenomenon (which should also be looked at). I also find the timing of the survey interesting. Over 20 years I have noticed that the heaviest loadings of the year at Canary Wharf are in October and November, as no one is on holiday. Schools are in session, the ski fields are not open and most Canary Wharfers are just back from a beach holiday, everyone is in the office. I always wonder why there is such significant delay on the Jubilee between the train stopping and the doors opening, seems to be between 1 and 2 seconds. This adds up to about a minute on end to end journey time. If dwell times are so tight maybe this could be tuned out of the system. At some point between Saturday evening and this evening the notice has been moved to the front (ie t-op visible) side of the noticeboard. I still don't think that they'll have an easy time reading it - it's not designed for viewing at a distance and is too wordy for the short time they have. That’s due to the Accurate Stop indication that Thales SelTrak system uses to confirm that the doors can be released by the operator. The Vic and Central use conventional Correct Side Door Enable (CSDE) loops which have a generous tolerance hence why doors release quicker even if under automatic operation. Accurate Stop on the Jubilee line is arguably necessary given the tight tolerances for stopping on platform edge door stations which I would add in manual days instinctively brought about defensive driving coasting below 5mph for the last few yards to make the mark. Typically the AS indication will flash up in 1/2-1 second after the train has come to stop for the 1996 stock which is not bad going considering the quantity of data that is exchanged in that time. The AS indication for the 1995, however is on comparison much more lethargic in some locations Embankment NB being the first example that springs to mind.